First hand narration and interviews with the major participants of the Strike. This book tells the story of Minneapolis as it became a union town under the impact of the organizing drive of Teamsters Local 574. It includes interviews with participants from all sides in the strike and gives a blow-by-blow account of the three strikes that year. The Organizer Strike bulletin of Local 574 published only published during 1934. 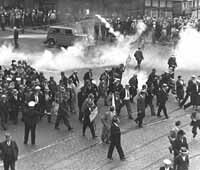 It was pubished daily and weekly depending on the intensity of the strike actions. Edited by Trotskyist leader James P. Cannon it provided a voice the striking drivers and a tribune of the labor movement that year.